"Allow me to present the infamous...Simon Templar." Simon Templar, a.k.a. The Saint, is probably one of longest running serial characters in history. The character dates back to the 1920s, and has appeared in almost every written form imaginable; from novels to comic books, all from the mind of author Leslie Charteris. Obviously, the leap to film was inevitable, and several TV shows and movies were spawned from the classic character. The incarnation of The Saint that has firmly rooted itself in the minds of most people, however, is the 1962-1969, British television series, which starred Roger Moore as the titular "international man of mystery." The origins and motivations behind Simon Templar's long series of misadventures are unknown; all the audience is allowed to know is that he's wealthy and knows his way around the world. He's something of a scoundrel, but he's not called 'The Saint' for nothing. Templar usually does good deeds and helps out old friends, but, almost always, there's something in it for him. As I often explain it, he's the Robin Hood who kept just enough loot from the poor to be comfortable. Simon Templar is enjoying a trip to Monte Carlo, when he stops an assassination attempt on a mysterious, deposed Middle-Eastern king. The king is grateful, and asks Templar help him transport $5 million in jewels into the country to help him 'buy' back his throne. Templar agrees, for a fee, but is also stuck with the King's Queen; a nasty, pretentious, witch who hounds Templar at every turn. Filled with a equal dose of Saintly humor and thrills, this makes a very good start to the set. Simon is quite the chivalrous, ladies man when he saves a young girl being harassed by a sinister ne'er-do-well. In the process, though, he gets himself mixed up with the girl's extremely wealthy family and a plot by an old enemy of theirs to get even. The girl is kidnapped and Simon must be the rescuer. This is quite a star-packed episode with appearances by William Sylvester, Paul Stassino (who had been in the Bond film Thunderball), Lois Maxwell (another Bond film alumnus), and even a brief appearance by Patrick Troughton who, by the time of this airing, was already getting into the role of The Doctor for Doctor Who. The episode is top-notch Saint as well. Simon travels to Geneva, Switzerland for a little rest and relaxation. Unfortunately. that's all interrupted when he unwittingly aids a Russian scientist's attempt at defection. As a result, he becomes the enemy of both the Swiss police and the Russian secret service, but the scientist's daughter emerges to help Simon. This is a good episode that's more like the typical, old-fashioned Saint, with espionage as a major factor. Templar arrives in Brazil, complete with warm greeting from the local dictator and chief of police. His baggage gets mixed up with another woman's things, and Simon discovers she may be indeed be trying to assassinate someone, possibly the dictator. By following her around a bit, Templar gets himself involved in an attempt to oust the dictator, but he knows that wouldn't be such a bad thing. It would seem Simon's weakness for women gets him into yet another jam, and it's just as entertaining as the rest. The Saint runs into some strange plans in Germany, where a prominent laser scientist has been targeted for death by some mysterious organization. Templar is asked to investigate on his own, and he uncovers some very dirty dealings to blackmail a South American dictator. One of the real treats of this episode is the appearance of wonderful character actor, Vladek Sheybal (yet another Bond alumn). It's Saint Simon versus the Dragon, or so many would have you believe. While travelling to Loch Ness, Templar meets a girl who claims that the Loch Ness monster killed her dog and left footprints all about. The community is buzzing with news of the monster attack, but The Saint has his suspicions that all the fuss is being caused to mask something much bigger. This oddly plotted episode makes a nice change of pace from the espionage-style work of the previous shows, and is also the first episode of this season directly based on a Leslie Charteris story. If it sounds strange, it's actually pretty tame compared some of the more bizarre Saint adventures in the past. Like most British television, what drives The Saint is the adherence to solid acting and writing. Sure, the effects might be lame, and the sets might get embarrassingly repetitive (the same "city street" set is used in all of these episodes), but no one cares because the storytelling is so good. The Saint is a real gem of serial television, thanks largely to its classy presentation. Obviously, comparisons to James Bond are hard to avoid, as the two literary characters share many similarities. Roger Moore was actually top choice to play Bond originally, but when his first Saint television movie was more popular than expected, he was signed into the series. Of course, Moore later took the reigns of Bond, and it's very easy to see why. Moore was born to play both roles, more so Simon Templar than James Bond. 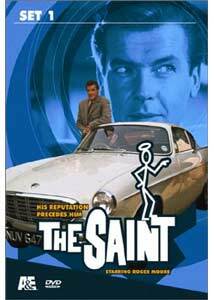 Saint has also enjoyed a long life of reruns, and for quite a while I watched my weekly dose Simon Templar until cable providers changed and we lost that channel. The 1997 movie starring Val Kilmer also brought a lot of new fans to the series and the books, even though that movie had very little to do with either. It would seem the time is incredibly ripe for a DVD release of the show, so I'm glad we're seeing these now rather than too far down the road. While a bit dated, I don't think the entertainment value of The Saint will ever get old. Image Transfer Review: A&E has always done pretty good work with these older, Carlton licensed shows, but The Saint sets some impressive standards. Each episode is crystal clear, with superb colors and fine detail. Absolutely no compression flaws show up, even in the murkier scenes. Although there are a few hints of source damage (a few scratches and hairs) and some scenes with rear projection and matting look a little dirty, you've never seen The Saint look this good, save maybe when it was originally broadcast (and I doubt even then). Stellar work on this series. Audio Transfer Review: A Pro-Logic mono mix is used here, and it's very satisfying for what it is. Everything is perfectly clear, and it gets very loud and enveloping without distortion. Music and sound effects come across very well; age does not seem to have had any major negative effect on the audio. For a mono track from the 1960s, I think most people will enjoy it without thinking about it. Roger Moore biography and filmography. Extras Review: The only real extra feature is a series of still photos from episodes on the disc. Some of them are directly from the shows, while others seem promotional in nature, but still relate to these episodes. There is a bio/filmography for Roger Moore, and the broadcast teasers for each of the episodes in this set. To be honest, I had hoped for maybe a brief interview with Moore or maybe have him present the disc himself. Thankfully, A&E seems to be going with the format of putting six, 50-minute episodes per box, which is a far cry from what we've been seeing in DVD releases of TV material. This is a meaty box set, and well worth the money. It should really set the standard, as well, for all the companies still producing 2-3 episode per $20 disc formats. The Saint is here, and, hopefully, to stay.